Well there’s the proof you’ve all not been needing to confirm my lack of sanity. The pot above has been around for a good few months now, it came out during a bit of a mad phase at the end of last year, it got fired in Doug’s kiln the other month. What was I thinking? I have no idea but it was good fun when I did it and the decoration is very loosely globe artichoke based. 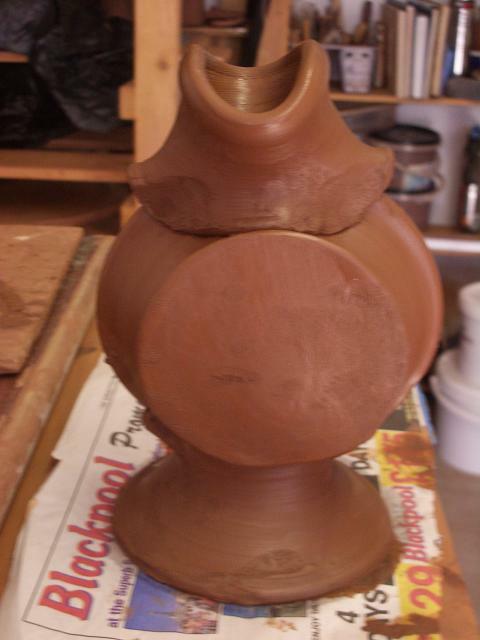 There were a few slightly less than my usual type of pot things but only this one survived. Today, again where my head was I’m not quite sure but this appeared, much smaller than the other and this one was just thrown and assembled bang bang bang as everything cam,e off the wheel hence the soft wobbly not quite straight nature of it. Looks like a fish standing on it’s tail. It’s for no particular purpose other than just to have a go I suppose. The sun continues to shine in south-west Scotland, it’s been positively hot the last four days or so, today I was out cycling wearing just jeans and a long sleeved t-shirt and the sleeves of the t-shirt were rolled up! I know! Can you believe it. It’s lovely. My pansies are starting to say hello at work. 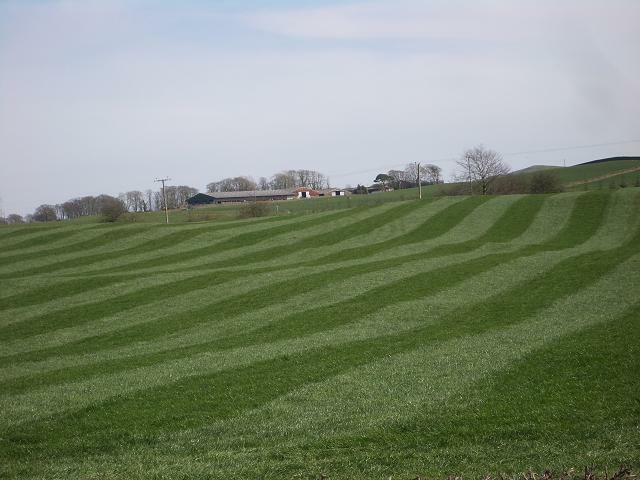 Stripey field time, I love how it looks when they’ve been ironing their fields. There is I’m sure a more correct word than ‘ironing’ but that’s essentially what they’re doing I suppose. 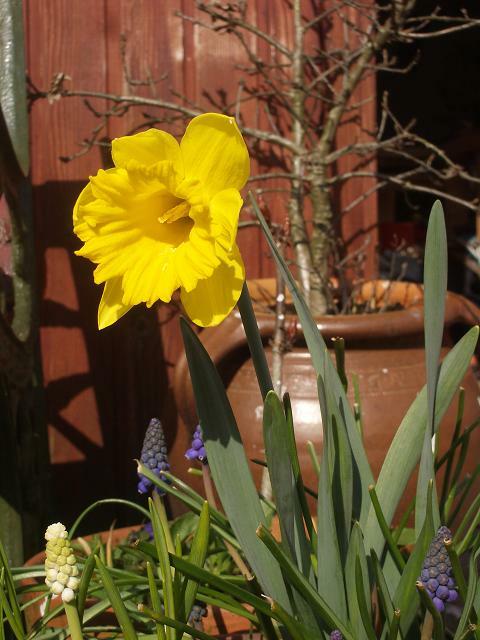 The daffs are out in force, well ok not in this particular plant pot but out and about in general they are. The verge in the middle of Rhonehouse is a riot of dancing daffodils, it looks fabulous. Oh and in response to the “Don’t ask” post, I was trying desperately to modge up the weird cement for the lightweight kiln bricks as it had gone too hard to use but I was assured it would water down well enough. I’d just broken my paint stirrer thing that I use for breaking up and mixing my glazes and slips and so was resorting to feet. It was very very cold and highly amusing and did no good what so ever but Jason found it hysterical. It’s now, after much TLC (and a very sore thumb from impaling a slither of rock hard cement up under my thumb nail yesterday – ooooooooouch!) happily sitting in buckets in a much happier and more usable state. Hopefully friday will see it not in buckets anymore but between bricks. Fingers crossed. 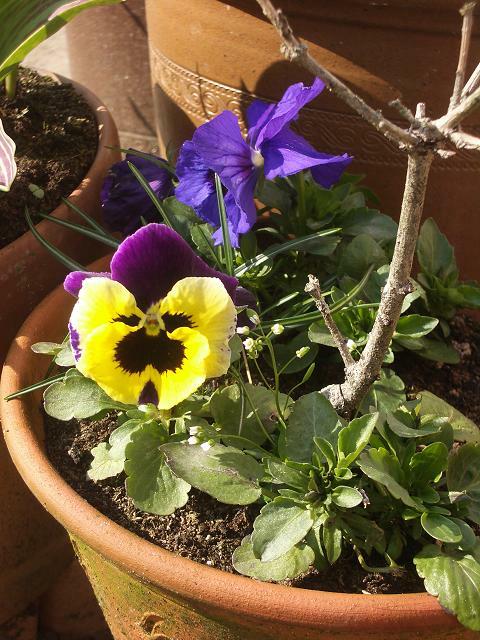 This entry was posted in cement, daffodils, many handled vase, pansy. Bookmark the permalink. 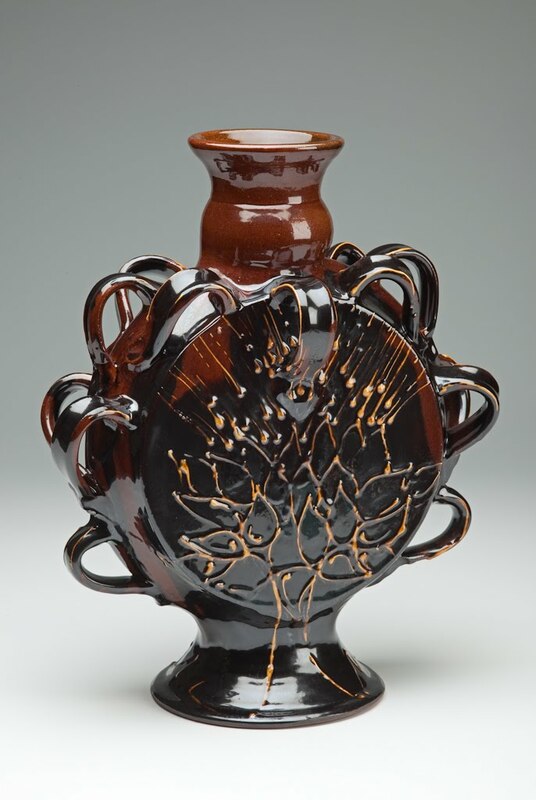 A beautiful, rich, vibrant pot. Lots of energy in that one. I think the artichoke pot is really super. We've all got to do the mad things now and again, mine dont usually come of at all. Rich coloring and the texture complement each other, I like it.